Carrageenan is obtained from red seaweeds which were widely used in Europe and Far East as an important food ingredient. These are also called edible seaweeds which are also preferred for its viscous property and presence of naturally occurring polysaccharides and carrageenan is one among the different types of polysaccharides. Carrageenans are of different forms and they can be identified in terms of the chemical structure they have. 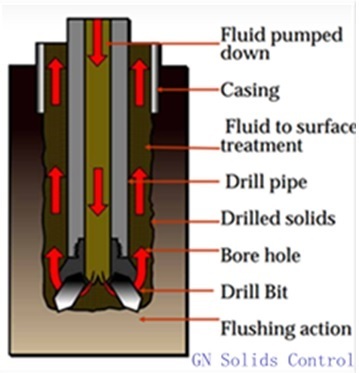 The chemical structure on the other hand is exhibited in the form of its properties or behavior such as thickener or reversible gelling agent, etc. 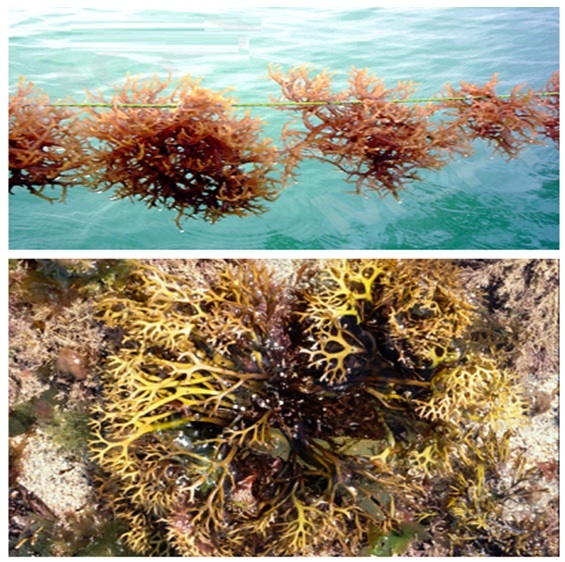 The carrageenans differ in texture as well ranging from soft form to elastic or brittle in texture. When it comes to applications these polysaccharides produces different reactions synergistically with popular plant seed gums like locust bean gum, etc. Similarly, it is differentiated into different forms for commercial applications. 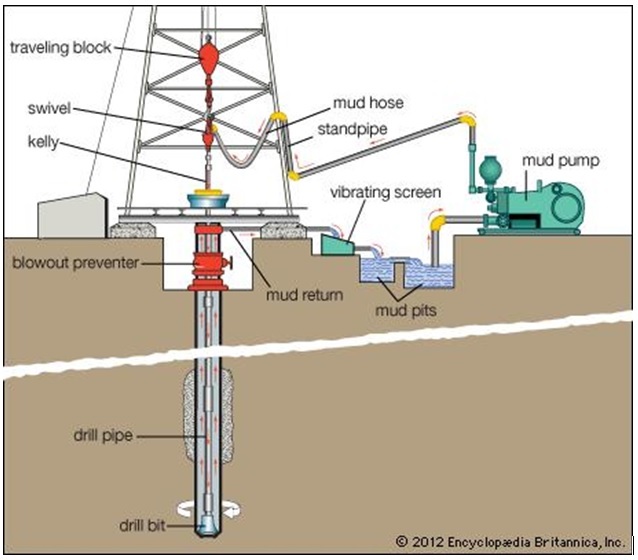 The extraction method also differs while obtaining in various types. Iota and Pharmaceutical Industry-It is a kind of carrageenan that readily forms into strong gel when combined with calcium salts. This gel form is soluble in water and stays elastic in texture. It contains 28 to 30% of ester sulfate content and basically available from sea weed variety called E.spinosum. It is applied in pharmaceutical industry as an alternative to neuraminidase inhibitor in the preparation of nasal spray for influenza or early symptoms of cold. Kappa in Dairy Products-It is the most common form of carrageenan that is also preferred as food grade. It produces strong gel when combined with potassium salts and forms into brittle gel when mixed with locust bean. This contains 25 to 30% of ester sulfate content. It is widely used as a stabilizing agent in dairy products. When it comes to interaction kappa carrageenan form of carrageenan can interact with locust bean and the reactive product is applied for stabilizing milk products. Lambda For Creamy Sensation-Lambda differs widely from that of the above two popular forms and it is applied for obtain high viscous property in product and it is soluble in cold water where as the above two forms are soluble in hot water. It is applied to obtain creamy feel in dairy products. 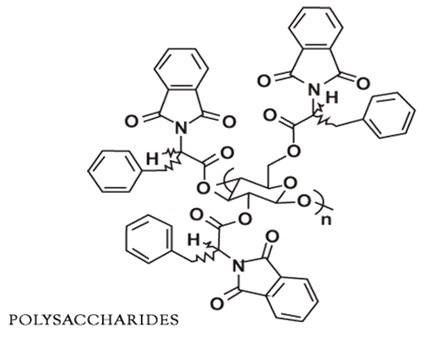 Furcellaran-It is classified into extreme kappa type however, has limited polysaccharides and can be identified only with the help of analyzing the chemical structure with that of others. However, not many industries prefer this form. Refined and Semi-Refined Carrageenans – Apart from the above commercial grades, carrageenans are also classified into refined and semi-refined forms. The refined ones are obtained from complete filtration process. It obtains gelatinous nature and the filter technology is employed to extract the exact portion of carrageenan. 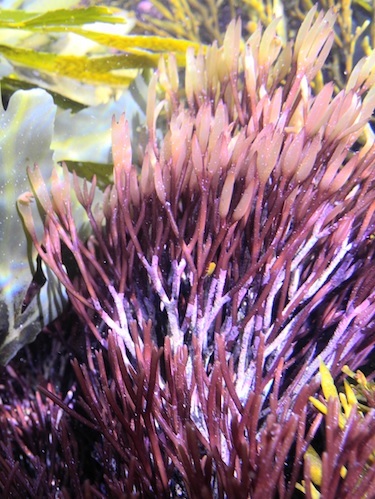 In case of semi-refined form, Eucheuma Cottonii is the type of sea weed from which semi-refined form is obtained. However, it is preferred for large scale production of pet food formulas. Carrageenan is obtained from processed sea weeds and it is available in different forms with different significance in industrial applications. They differ in chemical structure and properties. The origin of Guar in India can be easily traced back to several years however; this plant was considered mostly for its vegetation for the bean was used as one of the nutritious vegetable varieties. As technology helped people to explore into the usability of plant seeds, Guar bean seeds were targeted by several research people for the tremendous properties it exhibited for industrial applications. The research result was the main factor that lead Indian agricultural scenario to focus specially on cultivating guar plant in India as the climate and soil was found to be apt to obtain successful results. Today, India contributes about 80% of guar production in the world. 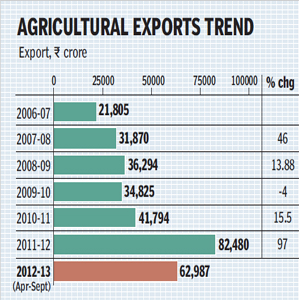 It has been estimated that India has crossed nearly 2.7 million metric tons during the years 2013 to 2014, say reports. There are strong evidences to understand the existence of guar plant in India since the consequences of World War II where there developed considerable scarcity of locust bean. Locust bean seeds were processed and the gum extract from locust bean had been a great source of additive in textile and paper industries in many parts of the world. It was guar gum powder which was then replaced to fulfill the scarcity of locust bean gum as guar gum was found to remain an extraordinary substitute with comparatively more percentage of viscous, thickenings, stabilizing and emulsifying properties. 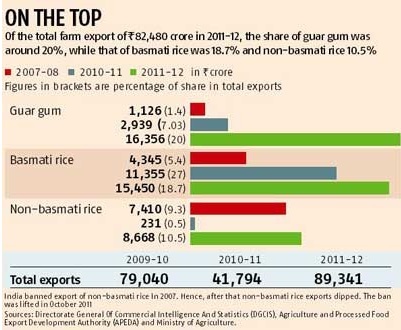 The commercial face of guar gum with global market can be traced back to 1953 since then India has been playing a crucial role in cultivating, processing and exporting seeds and gum extract of guar bean. Guar plant grows in regions with moderate rainfall and temperature and it is a semi arid region like Rajasthan, Haryana, Gujarat, Madhya Pradesh, etc. It is drought tolerant which is one of the favorable reasons suiting Indian regions mentioned about to grow guar successfully. Indian states including Uttar Pradesh, Karnataka, Tamilnadu, Andhra Pradesh also appears to share considerable amount of cultivation among the overall. 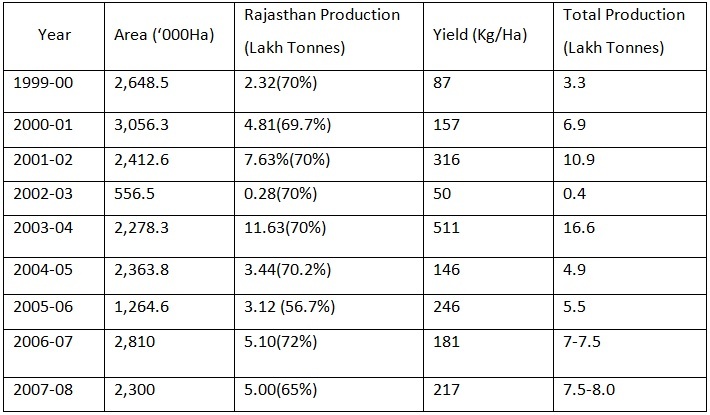 The table given below indicates production profile of Guar plant and subsequent growth helps to understand the strong role played in Indian agricultural and processing industries. Apart from guar cultivation, Indian industries also play a remarkable role in processing the seeds to obtain gum powder from guar seeds. There is excellent competence in Indian commerce when it comes to plant seed extracts like guar gum powder. Altrafine is one of the leading manufacturers and suppliers of guar bean gum powder and other types of plant seed gum powder in India. We have the latest technical and research facilities to obtain standard and internationally approved genuine guar gum and supply to several parts of India. 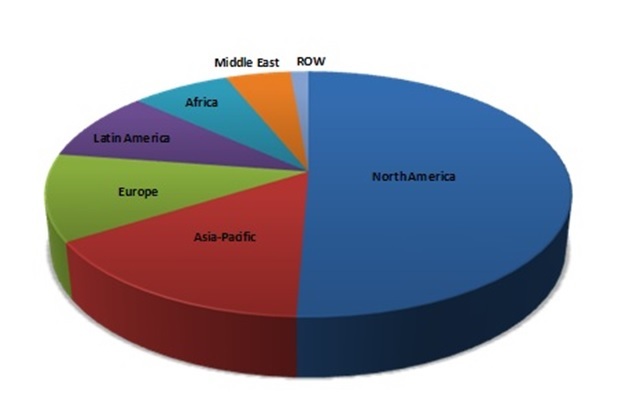 We have a big list of consumers from abroad for our processed products. One of the strongest reasons for our global popularity is that we directly obtain the raw materials for processing from farmers and hence we are stubborn about quality assurance. Guar plant is drought tolerant and can grow in moderate rainfall. Many parts of India are filled with similar kind of climate where guar plants are cultivated sharing maximum percentage among the global production. When it comes to processing Indian companies stays in the lead position as they directly obtain guar bean from farmers these are the reasons which agricultural scenario of India contribute for popularity of Indian market.